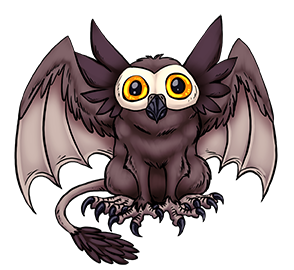 Although it was originally designed for nocturnal stealth and surveillance missions, this Kreature is highly affectionate and makes for a good pet. It can see in the dark as clear as the day, and its sensitive hearing allows it to detect even the faintest sounds more than 500 meters away. Its soft feathers have the added benefit of dampening the sound of its flight; it will playfully swoop down to surprise its tamer as if they were prey. Although its talons contain a neurotoxin which can inflict temporary paralysis, it needs to intentionally contract its venom glands in order to inject it. This way, accidental scratches to its Tamer shouldn’t cause much harm. For a projectile weapon, it will vomit pellets composed of the compacted bones and remains of its victims, bound together by its virulent stomach acids. Now I’ve seen many an “Owl Griffin” but yours here has to be the best I’ve seen. You’ve really demonstrated that not only is it cute it’s also a very effective predator. Most of the other “owl griffins” I’ve seen somewhat lack that predatory vibe that Griffowl here has.